The film presents the latest research into the subject of breast milk, shows what scientists are currently working on and asks which breast milk secrets will be revealed next. For some time now, there has been a real hype about breast milk. Internationally. Women have discovered their lactate can be a source of income and they offer it on the free market via the Internet. Doctors and midwives are calling for more breast milk banks. 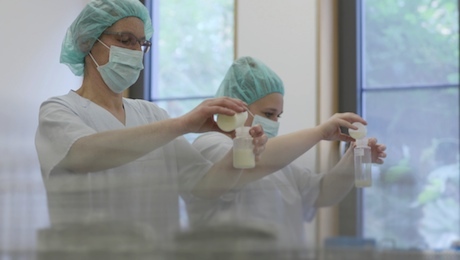 In Switzerland, the first centre for breast milk research has been established. Myths and legends surround the subject of breast milk, but not all information is scientifically sound. Although there are still many unanswered questions even among academics, one thing is undisputed: Breast milk is an especially valuable drink. The film presents the latest research into the subject of breast milk, shows us what scientists are currently working on and asks which breast milk secrets they want to reveal next. For example, scientists in Sweden have discovered that breast milk contains a substance that kills cancerous cells within a few hours. But the new breast milk hype is also producing some bizarre developments. Body builders, for example, swear by mother milk as a way of gaining muscle mass. Others use it to make cheese or ice-cream, and some mothers even hang breast milk jewellery around their necks.